Hawaii, Chapter 6: Hawaii's "Big Island"
"Parting is such sweet sorrow." Maui has been amazing, and I've made memories to last me a lifetime. My co-workers have been like family, and I cherish the friendships I've made with the variety of new bungalow guests that check in everyday, though it's been hard to see them come and go, and with many of them great distances away and with too much time apart, I'll be lucky to see but a handful of them again. It's so hard to leave Maui behind, but I'm excited to see what other adventures lie ahead. Originally when I was planning my trip to Hawaii, I picked one island to visit, Maui, but other Hawaiian islands offer unique experiences to be had all on their own, and they're only a cheap, island-hop away, I left the "The Magic Isle" of Maui, and headed to Hawaii's "Big Island." Big Island, or the island of Hawaii, "is larger than all of the other islands combined, and is vast enough to hold 11 of the world’s 13 climactic zones—from sandy beaches to snowcapped mountains. 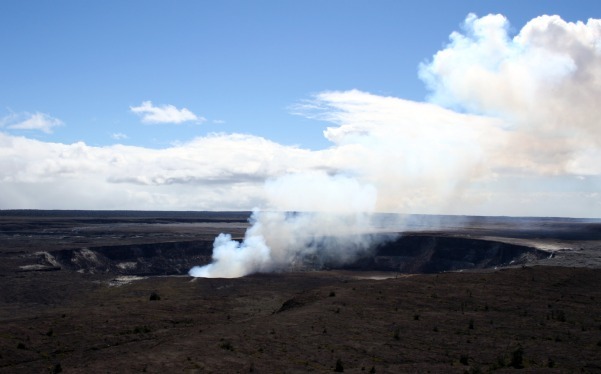 See waterfalls, rainforests and botanical gardens in Hilo, explore the calm and clear water off of Kona, or view Kilauea, one of the world's most active volcanoes, in Hawaii Volcanoes National Park." I flew in on go!Mokulele's 9-seat "Island Hopper" cessna, operated by Mesa Airlines. The 40-minute flight was awesome! I had a window seat with spectacular views of the islands and the vast Pacific ocean, and with helicopter tours costing $200 and up, I definitely got my $83 worth! I landed in Kona, located on the dry, west side of the island. After picking up my little rental car I drove to Wal-Mart to pick up supplies such as sleeping bag and snorkeling gear, which I would return after use (think of it as a free rental, lol). I drove down to Pineapple Park's Kona Hostel ($28.85 w/ tax) in Captain Cook to meet up with an Australian couple I met at the Banana Bungalow in Maui, pulling over for a stunning, welcome-to-the-big-island sunset on the way. After checking in with Annie, the strict, little Asian woman who owns the property, she gave me a tour of the grounds, emphasizing the peace and tranquility it offers, and literally telling me "This is not a party hostel like Banana Bungalow" lol. This was perfect, because I was exhausted and all I wanted to do was relax before going to bed. When she showed me the kitchen, and there was Brad & Dee, my Australian friends, whipping up a delicious vegetarian dinner to share with me. At dinner the 3 of us discussed our plans, with Dee & Brad agreeing to chip in towards my rental car. With our game plan together, we got an early start to bed. After breakfast (I tried some free starfruit provided by the hostel) the 3 of us set out on our adventure, beginning with Anaeho'omalu Beach. 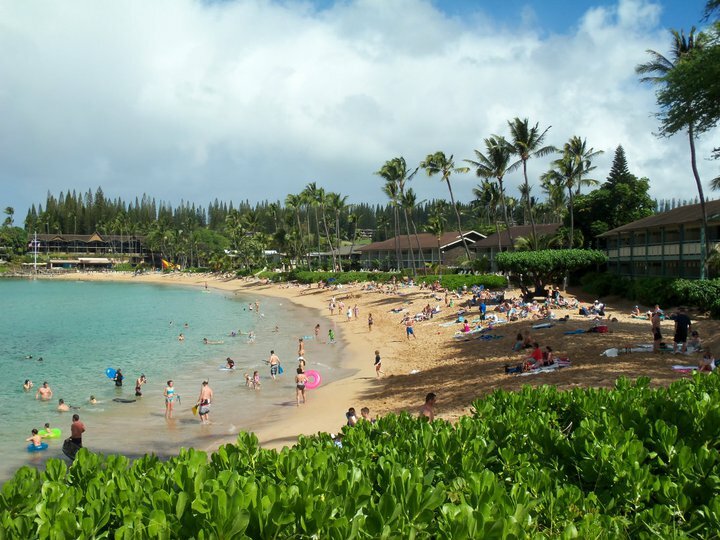 "This expansive beach of golden sand mixed with black lava grains fronts the Waikoloa Beach Marriott. Graceful coconut palms line the beach and behind it are two old Hawaiian fishponds that served the Hawaiian royalty in the old days. A walking trail follows the coastline to the Hilton Waikoloa Village next door, passing by tide pools and ponds." 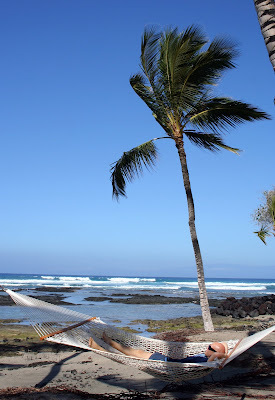 Continuing northbound, we checked out the beach at Mauna Lani Resort, where I fell in love with the lazy hammocks looking out onto the ocean and tide-pools. Next we visited Hapuna Beach State Park, and while it was closed due to dangerously high surf, we parked on the shoulder across the road from the gate, and checked it out. And indeed, the surf was high! There was a handful of other rebels that had come to see what all the fuss was about for this very highly rated beach, and there were surfers taking advantage of the raging water, too. So much for "closed," lol. We stopped at the Puʻukoholā Heiau National Historic Site, which preserves the ruins of one of the last major heiau (temple) built in the Hawaiian Islands (and one of the largest restored heiau in Hawaii), by one of the greatest leaders in Hawaiian History. It was constructed overlooking the Kohala coast between 1790 and 1791. King Kamehameha ultimately fulfilled the kahuna’s prophecy when he united the Hawaiian Islands in 1810. The story is fascinating, but our stay was quite brief, as there really wasn't much to see, since you can't get close enough to fully appreciate it. We at lunch at Tako Taco in Waimea, a brightly painted hut serving up authentic Mexican food. I ordered the mahi mahi fish nachos, and especially loved the salsa! We took in a breathtaking view at the Waipi'o Valley Overlook. 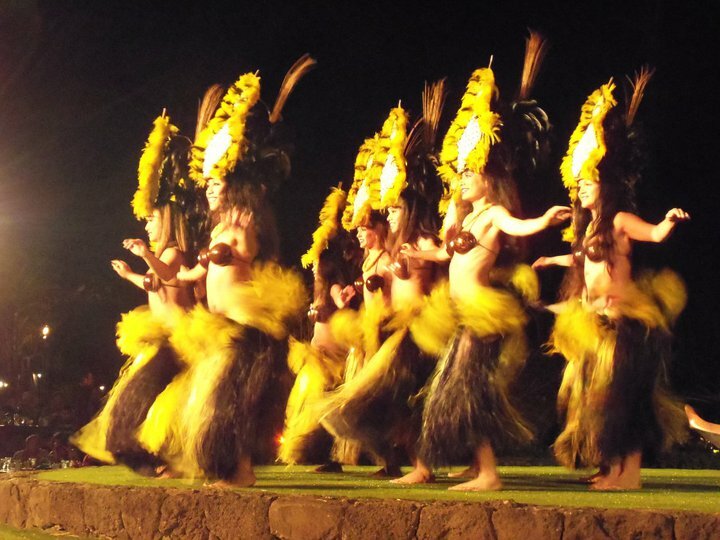 "Bounded by 2,000-foot cliffs, the "Valley of the Kings" was once a favorite retreat of Hawaiian royalty. 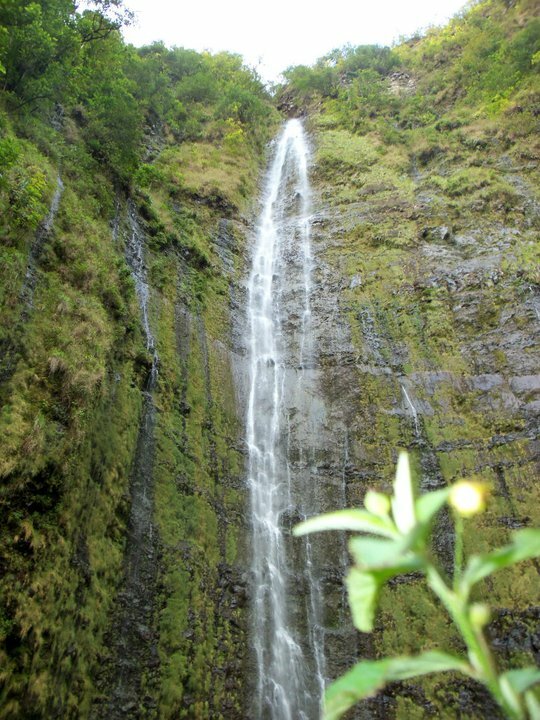 Waterfalls drop 1,200 feet from the Kohala Mountains to the valley floor, and the sheer cliff faces make access difficult, and is restricted to organized tours and 4-wheel drive vehicles only. 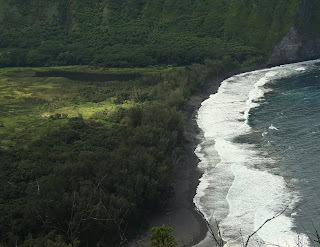 We took the fun, winding drive down to Laupāhoehoe Point Park, a perfect little scenic place to picnic, relax and explore tide pools, but also the site of the school building that was inundated by a tragic tsunami, drowning twenty students and four teachers. It was terribly ironic to see the kids splashing in the water at the bottom of the boat ramp (where a big white sign clearly states "No playing in water!"). Click here for pictures of the park. Lastly (phew! ), we admired the beautiful waterfalls of Akaka State Park. After saving ourselves the $5 vehicle fee by parking just up from the parking lot, we walked the short 'n sweet 0.4-mile uphill hike through a lush rainforest filled with wild orchids, bamboo groves and draping ferns. 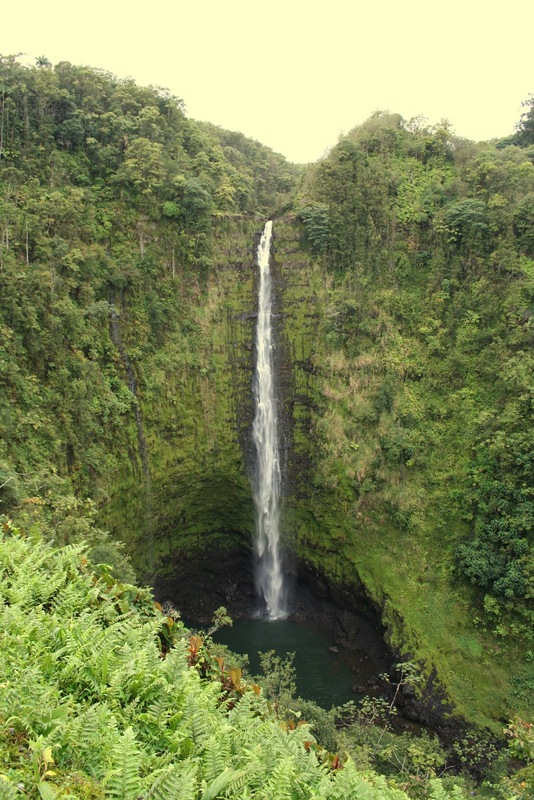 As we followed the paved footpath, we first saw the 100-foot Kahuna Falls, then continued to follow the loop to the towering Akaka Falls, plummeting 442-feet into a stream-eroded gorge, possibly the Big Island's most famous waterfall. When we got to Hilo, located on the lush, rainy, east side of the island, we checked out a couple of hostels and decided on Pineapple Park's Hilo Airport Hostel (Annie from the Kona location referred us here with a great deal of $23/night w/ tax), where our Swedish friend Johan from the Banana Bungalow in Maui was also staying. We played some pool before going to bed - I actually didn't do too bad! Brad & Dee and I got to share a room with 5 beds all to ourselves. Today was fun. I got to learn Australian lingo like "heaps" (lots), but they were right, I should slow down and enjoy. I tend to go, go, go! This morning the 3 of us browsed through the tents of the Hilo Farmer's Market, "An abundant and colorful market that draws farmers and shoppers from all over the island. Bright orchids, anthuriums, and birds-of-paradise create a feast for the eyes, while exotic vegetables, tropical fruits, and baked goods satisfy the stomach. Craft and jewelry makers and clothing vendors round out the market. It was really busy and crowded, so we didn't stay long, but we picked up some veggies and kava, the roots of which are finely ground to produce a drink "with sedative and anesthetic properties, without disrupting mental clarity." Then we drove downward toward the sea on the second of the two main drags of the park, Chain of Craters Road, to the Pu'u Loa Pretoglyphs Trail. 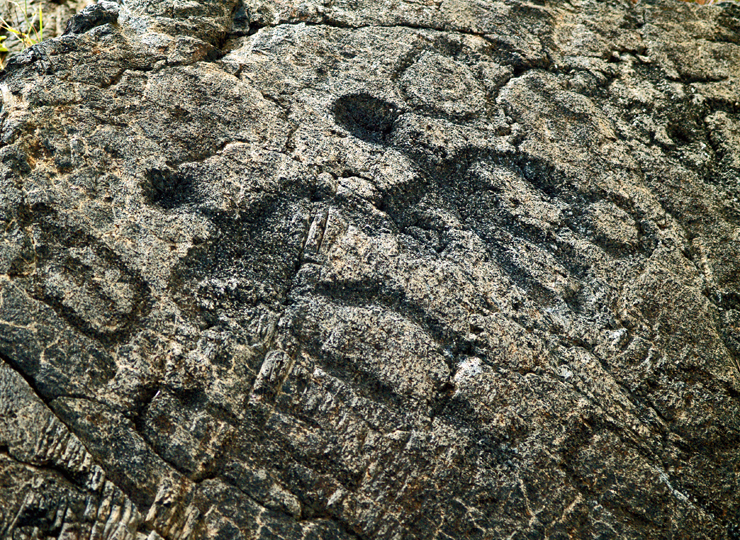 A 1.5-mile round-trip hike over "a gently undulating pahoehoe lava bedrock trail to reach the boardwalk at Pu`u Loa, a site which contains a vast area covered with over 23,000 pecked images in the harden lava, known as petroglyphs. For me, this was the most interesting part of the park. Check out some of the petroglyphs here. My rating of the park, is 3 out of 5 stars. For $10 it's a great value, but because of my preconceived expectations of the park, I have to completely agree with "Golnarsarge's" review on Fodor's, and say, "If you're interested in endless craters with nothing in them, or have an interest in geology, this place is for you. 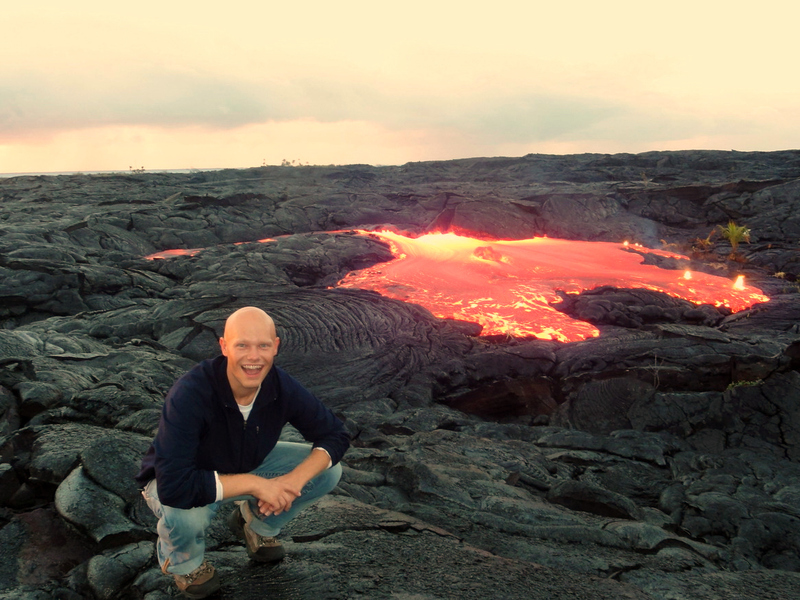 If you're there to see an actual volcano eruption and active lava flow, you're not going to see it here." You can, however, see active eruptions and flowing lava via helicopter, boat or hike (at your own risk - conditions constantly and unpredictably change). After exiting the park, we headed down Highway 130 to the county-approved viewing area, where the road dead ends. It's open daily from 2pm-10. Entry and parking were free. 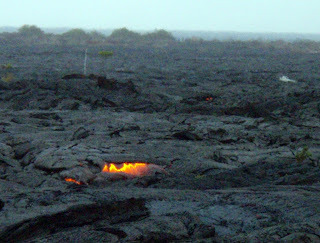 We didn't see any major lava flows, but got to see the it crack, glow, sizzle, and flame, which was pretty cool. There was a manned tent set up from a local company advertizing guided hikes onto private property to view the big lava flowing into the sea, though it seemed a little sketchy and wanted to think about it. This morning Brad & Dee and I left the hostel super early before sunset and went back to the viewing station to try and see if we could see more lava, but it was the same yesterday evening, however, we did catch one of the most colorful, spectacular sunrises I've ever seen! Today I visited Pana`ewa Rainforest Zoo & Gardens in Hilo. It's small, but free. My faves were the white bengal tiger, giant anteaters, zebu and miniature zebu, Solomon Islands skink, binturongs, and the corpse plant. 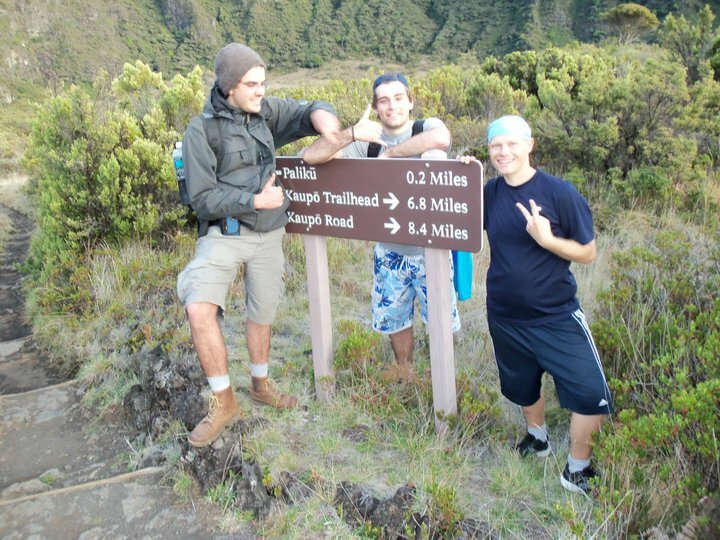 Later my friend Brad & Dee, and Johan went up to the top of Mauna Kea! "To ancient Hawaiians, the snow-covered summit of Mauna Kea was where the gods lived. To astronomers, with its close-to-the-equator location and unusually clear, pollution-free skies, it's the best place on Earth to see the stars. 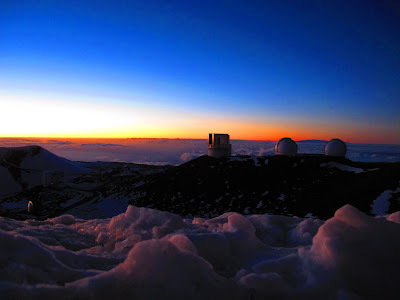 Rising 9,750 meters (32,000 ft) from the ocean floor to an altitude of 4,205 meters (13,796 ft) above sea level, it's the highest island-mountain in the world, and its peak is home to the world's largest telescope." We traveled 9,200 feet up to the little Visitor Information Station and Onizuka Center for International Astronomy to stretch our legs and acclimatize to the altitude- there's 40% less oxygen up here than at sea level. "The Mauna Kea summit road is about 15 miles long, and includes a steep (15% grade) unpaved stretch that, beyond the visitor information station, is restricted to 4-wheel-drive vehicles (but my car only had about 1000 miles on it, so we felt comfortable risking it). The road reaches its highest elevation at 13780', making it the third highest auto road in the United States." 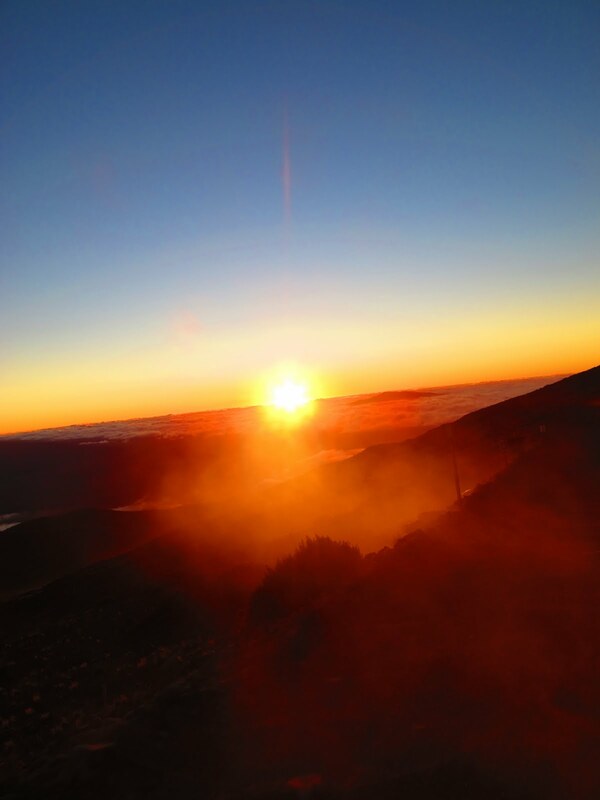 We reached the top without a hitch, and arrived at the summit just before the sun went down into the clouds. It was one of the most spectacular sunsets I've ever seen. We would've wandered around the colony of observatories, "where 11 nations have set up 13 of the world's most sophisticated telescopes for deep space exploration," but we were FREEZING cold! We visited the Visitor Information Station on the way down to check out their free, nightly Star Gazing Program, which includes documentaries, outdoor telescopes pointed at specific objects, and a laser pointer "star tour" that points out constellations and various objects. 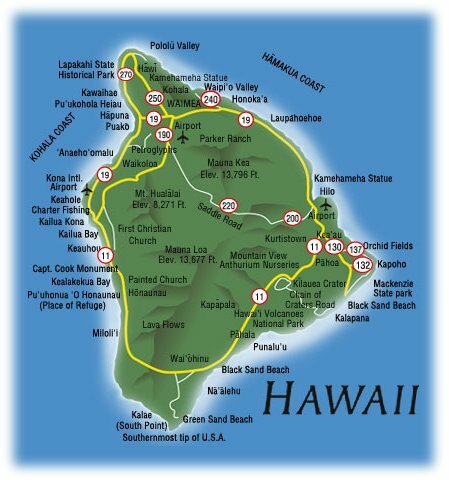 Today I picked up a hitchhiker named "Nectar" on the way to my destination, who gave me tons of useful information and recommendations for the rest of my trip through the Hawaiian islands. Good karma! I visited Punalu'u Beach (aka "Black Sand Beach"), "the most expansive and most accessible black sand beach on the Big Island." There is a plethora of activities to be had here, including exploring the black sand beach, watching the green sea turtles, swimming, snorkeling, picnicking on a blanket under one of the coconut trees, or enjoying the park's beautiful freshwater fish pond, part of the second largest spring complex on Hawai'i Island, a series of wetlands fed by basal springs and intermittent streams that support a broad range of native fauna. Next I drove down to Green Sand Beach, a rugged, remote beach, tinted olive green from the olivine crystals - a semi-precious stone originating from the littoral cone that surrounds the small bay. The ocean erodes these stones and crushes them into fine sand. 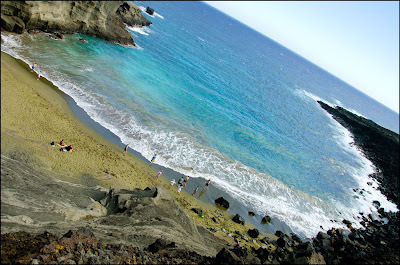 Getting to the beach without a 4-wheel drive truck involves a 4-mile coastal round-trip hike from Ka Lae (South Point), the southernmost tip of Big Island, heading northeast. Click here for some pictures from the net. 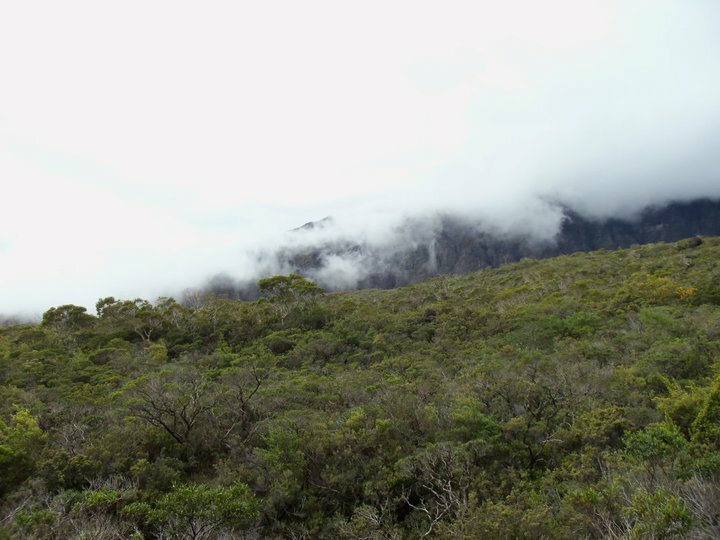 The rugged hike was beautiful, following the black, jagged coastline of the bright blue ocean. Upon arriving, I descended down steep cliff side on an unimproved trail. Though the "green" sand of the beach was not as brilliant as the websites would advertise it, it was a terrific hike leading to an awesome destination. Getting back from the hike was easy, since I was offered a ride from a cool guy from Texas, named Bryan. The ride was interesting, as I found I was riding in the bed of his big pick-up truck with a crew of professional disc golfers that had just played the "Big Island Open," including David Feldberg #12626 ('09 World Champ! ), Scott Rief #26039, David Greenwell #962 ('95 Hall of Fame! ), and Melody King #29858. I watched them throw a frisbee around down at the beach - I thought they were really good; I had no idea I was in the presence of champions! I don't know anything about disc golf, but I did know to get their autograph anyway :) In the back of the truck they talked about their various sponsorships and stuff, and about their awesome hikes on the hardened lava flows near the viewing station outside Volcanoes National Park. In fact they were planning another little hike tomorrow morning, and Scott invited me along! This morning before sunrise, while the lava viewing area was closed, I met the disc golf crew who let me tag along as they hiked onto the restricted area of hardened lava. 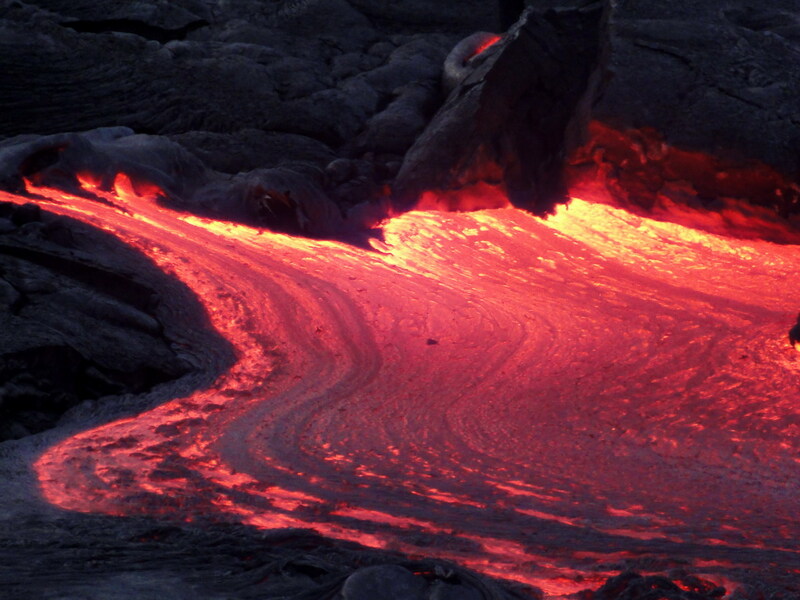 They led me to a moderate flow of magma, pouring down out of the upper crust, forming a lava pool in the collapsed area. We literally got so close (and so hot), one of them poked a stick in it! They talked about how the lava flows are so active in this area that a woman lost her house to it just a week and a half ago - and they pointed to the remaining metal frame only about a couple hundred feet away! Holy crap! 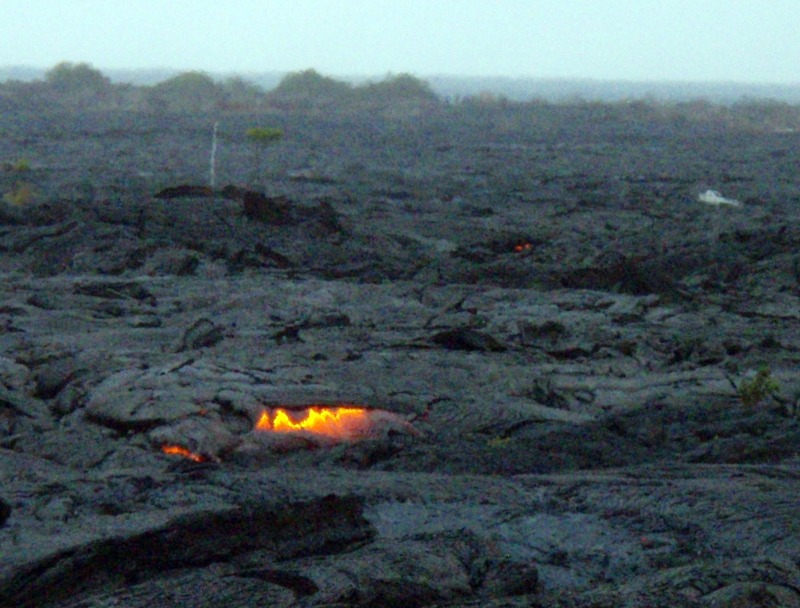 When we were getting back into our cars about to head out, a couple of newlyweds from South Korea approached me and asked if I knew where they could see active lava. I said goodbye to my new disc golfer friends, and led Heechun and his wife to the same place I had just come from. 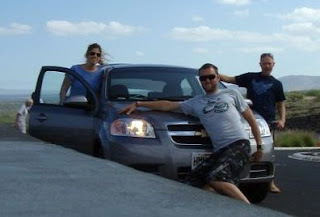 A group of others followed us as well, including a guy named Maurice, who emailed me a couple photos. They were amazed just as I had been, eagerly snapping photos that would create a honeymoon to be cherished into old age. Nearby, I spotted a new flow of lava, and as we approached it became bigger and bigger, heavily flowing more and more, filling in a massive caved-in area! 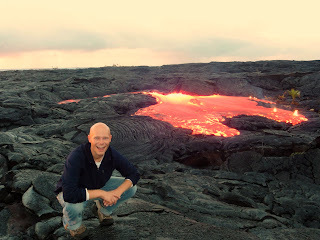 It was a sea of lava!!! I couldn't believe my eyes, it was perhaps the most awesome force of nature I've ever witnessed! That night, at the advice of Johan, I joined an organized trip on a chartered boat from Kona Honu Divers, for a night snorkel with giant manta rays - an experience I'll never forget! I arrived at about 2:30pm to check in at their shop in Kona, then drove down to Honokohau Harbor, where their boat was anchored to meet the guides and other people who had reserved a place. It was a group of about 10 of us, plus 4 crew members. About half of us snorkeled, while the other half scuba-dived. I think we left the harbor at around 3:30pm, and went snorkeling with tropical fish for an hour or so at location #1, before boating out to the other location to have dinner and swim with the mantas. On the way there, we saw several whales breaching - WOW! Now when we got to location #2 and had dinner, the lead guide said they hadn't seen any manta rays the last few times they had been out there, so if we want, we could go to a different location where we would be guaranteed a great time seeing lots of cool fish (it was evident this was his preference). No one said anything! I spoke up and said we were all here for the manta ray dive, so let's see some manta rays! Luckily, with that said, he decided we would stay here at location #2 and risk it - and man were we all glad we did, because it couldn't have been any more than about 15 minutes after having the special boat lights on and the floodlights from one of the hotels (attracting millions of minuscule plankton, which in turn attracts the manta rays) that there they were, the huge rays coming right up to the end of the boat to the lights! AWESOME! We all hopped in with our special flashlights and were swimming with the four huge mantas for about 30 or 40 minutes or so. They would basically swim in somersaults with their huge mouths open catching the plankton, coming so close that one even brushed up against my outstretched flashlight - it looked like it was going to eat me! The experience was absolutely amazing, unlike anything I've ever done before. These giant, gentle angels of the sea had wing spans of up to 12 feet! We got back around 8:30pm. This was the best $90 I've ever spent! So tired, slept in my Honda in the parking lot of the Kona Pacific Farmers Co-Op. Today I snorkeled in Kealakekua Bay, a Marine Life Conservation District, significantly historical site, and "one of the most beautiful spots on the island. Dramatic cliffs surround crystal clear, turquoise water chock-full of stunning coral and tropical fish. Due to the calm water conditions, extensive coral reef, and thriving underwater life, Kealakekua Bay offers some of the best snorkeling and diving in Hawaii." "Kealakekua Bay encompasses 315 acres and measures 1.5 miles in length and one mile in width. It is the largest sheltered natural bay on the Big Island of Hawaii. The spectacular sanctuary at Kealakekua Bay offers an abundance of tropical fish, a variety of gorgeous coral reefs and visibility up to 100 feet under water! 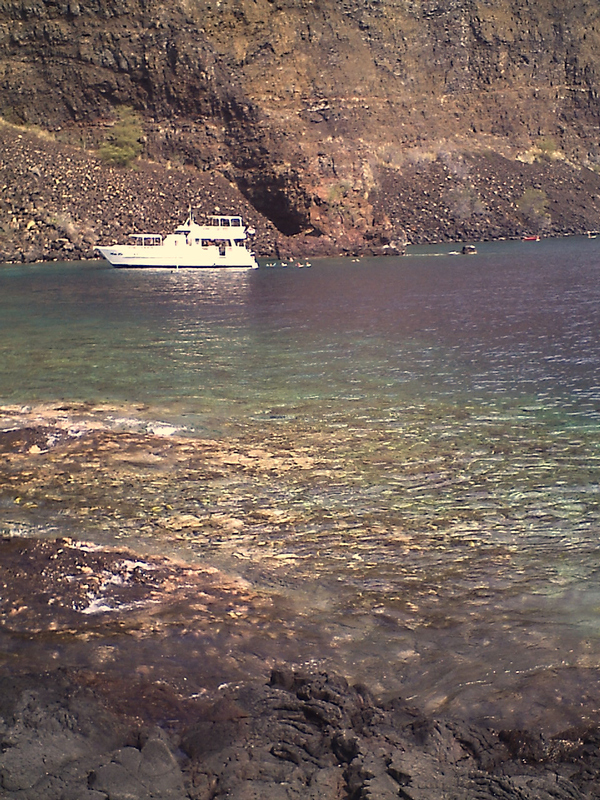 The calm, protected waters and sunny skies of Kealakekua Bay provide superior snorkeling and diving, with the water temperature averaging 76° year round." "Kealakekua Bay is an important historic location because it marks the site where the first westerner, Captain James Cook, landed on Hawaii’s Big Island. Cook was the first British explorer to establish contact with the Hawaiian Islands in 1778 on Kauai. Only a year later, he was killed in a skirmish with native Hawaiians right here in Kealakekua Bay. A white obelisk on the shore of Kealakekua Bay State Historical Park memorializes his death. On the east side of the bay there is also the Hikiau heiau (sacred temple) dedicated to the Hawaiian god, Lono." With waterproof camera in hand, I threw on my snorkel gear and spent several hours swimming all the way from the beach, alongside the cliff, to the Captain Cook Monument! I have never seen such a variety of different fish and eels anywhere else! Sure, I could've used more sunscreen, but it was totally worth it! Afterward, I relaxed with some wine on Kauna'oa Beach (aka Mauna Kea Beach), "a perfect 1/4-mile crescent-shaped, powdery-white-sand beach fringed with palm trees. This out-of-the-way cove is considered by many to be the most picturesque and relaxing beach on the Big Island, and is on The Travel Channel’s “The World’s All Time Best Beaches” list. 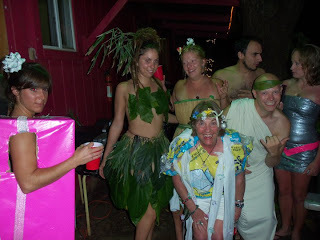 When I was done with my tan I drove back to Hilo and stayed at Arnott's Lodge Hostel, where I became friends with Ed and Wegas, both from Brazil (if I'm not mistaken). I left with Ed and Wegas early this morning to the lava viewing station, hoping I could catch someone who was hiking out to where the lava meets the sea, but alas, I wasn't so lucky, so I zonked out for a little while, as Ed & Wegas were exploring the lava field. When we got back I gathered my things and checked out of the hostel, made my way back to the Kona side of the island (a fun, laid back drive via Saddle Road and Hwy 190), returned my things to Wal-Mart (hee hee), and headed to the airport. The experience with Mesa Air was a nightmare - I had to check my luggage which was the first (it was always passable as carry-on with the other airlines), I went through security 3 times, they searched my bag and confiscated my corkscrew souvenir (yet allowed me to keep scissors?! ), we were delayed an hour, and had to switch to another flight/plane. *Note - my camera was stolen with all the hundreds of photos of the Big Island in it, hence I'm using photos from friends and the internet. Went sailing for the first time! Me, Jason, Jeremy, Ruth, Ramona, Tristan, Nadine and friend saw whales and a spectacular Maui sunset, and Jason let me take the wheel! Watched the Geminid meteor shower from Spreckelsville Euro Beach on Monday, December 13th. Joined the bungalow's Road to Hana tour on Tuesday, December 14th, with stops all along the coast, including Keanae Park (jagged, black lava shoreline and world's best banana bread stand! ), Wainapanapa State Park (legendary caves, a black sand beach, and I handled a banana spider! ), taco lunch under a road-side tent, body-boarding at Hamoa Beach, "Seven Sacred Pools" of Ohe'o Gulch (fresh water pools and waterfalls that empty into the ocean), and a 4-mile hike on the Pipiwai Trail (above Oheo Gulch) through a bamboo forest past the impressive Makahiku Falls overlook, ending at the massive Waimoku Falls, falling 400-feet down a sheer lava rock wall (which I climbed under for a quick shower - hooray, I didn't die!). Got naked at Little Beach several times, while swimming, sunbathing, body-boarding, and beholding breathtaking sunsets. Sang my guts out with good friends at two different beach bonfires on the dunes of Spreckelsville Euro Beach, the first bonfire (Thursday, December 16th) I even took over on guitar when Canadian Idol finalist Earl Stevenson passed out! "Baby Got Back" was a crowd-pleaser, lol. 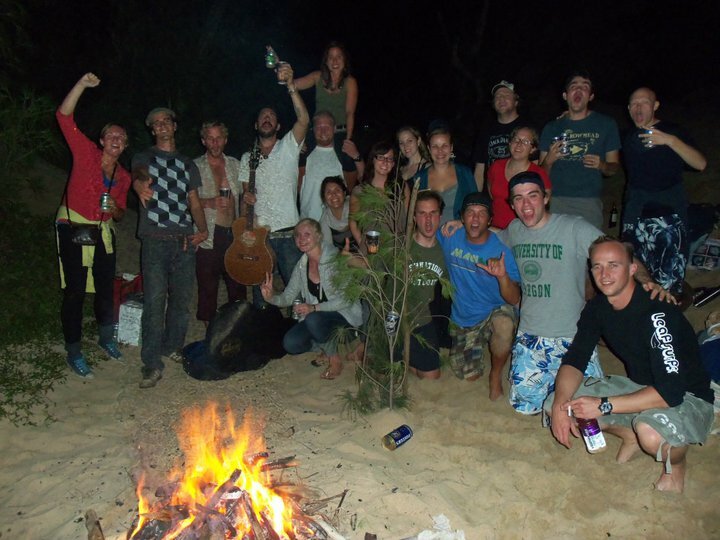 The second bonfire I slept on the beach - first time ever sleeping on the beach - thank god for the fire - brrr! The morning swim in the warm water was nice. Friday, September 17th-Sunday the 19th, I, along with my new German friends Benno, Marius and Matthias, went tent-camping at a secret, secluded site on the edge of a cliff (awesome sunrise), and back-packing up the strenuous, 9-mile Kaupo Trail to Paliku Campground, up 6,380 feet (1,945 meters) at the east end of the wilderness valley at the base of a rain forest cliff inside Haleakala National Park. We had consumed most of our food and water by the time we had arrived, and the people staying in the nearby cabin must have sensed it, because they thoughtfully brought us drinking water and leftover dinner. They said the Kaupo Trail is used for going DOWN the mountain, not up, lol! Ate at the lively Cheeseburger in Paradise in Lahaina a couple of times, trying the Maui onion rings (good, but nothing special), and taking in the mesmerizing sunsets out its oceanfront windows. Tried Hawaiian "Shave Ice" at Lahaina Ice Cream Parlour. It's like regular shaved ice, but it's served atop ice cream, and you get to choose from several tropical flavors. I chose the Passion Fruit, Mango and Li Hing Mui syrups over Maui Mango Madness sorbet. MMM! And I walked next door to Tutu's Pantry and tried some free samples of sauces and vinaigrettes, including Pineapple and Guava flavors! Spent a handful of afternoons, including Christmas Eve day with my good friend Merlin from Germany (after an unsuccessful attempt at running all over town in search of x-mas hats), at Puunoa Beach ("Baby Beach"), with excellent sunset views and conveniently located just a 10-minute walk up from the main strip of Lahaina (Front Street). One day I got to observe a romantic wedding ceremony from down the beach. 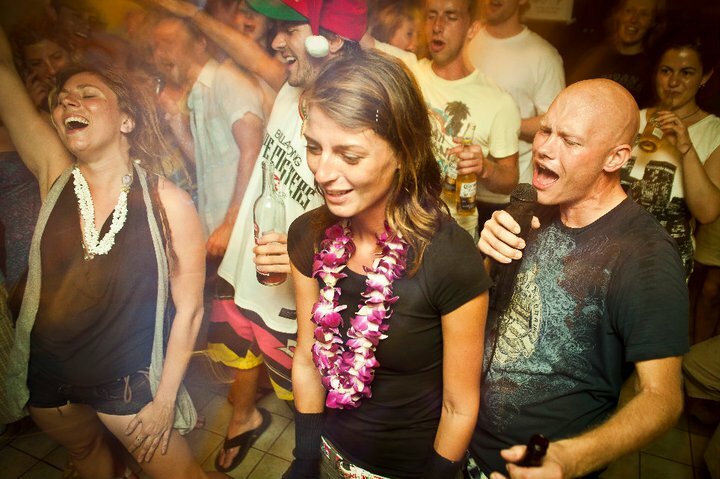 Hung with Keoni, a Maui native, and friendly couch-surfing host Merlin stayed with off and on. He took a bunch of us to karaoke at a Korean hole in the wall strip mall, showed us how to make "brass monkeys" (a 40-oz of Old English ale mixed with orange juice) at a cool spot overlooking the city of Wailuku, brought us to Pita Paradise for the world's best gyro, and introduced me to his friend Richard who he grew up with. The crew and I rocked it out at the Banana Bungalow Christmas Eve Karaoke Party! My signature "Baby Got Back" really got the crowd goin, lol! And what about Isaac and I's "Sexual Healing?" Or Matt # 1 and I's "Don't Stop Believin'?" The "Yellow Submarine"-turned "We all live in Banana Bungalow" garnered the most participation. Speaking of karaoke, I sang my songs ("Baby Got Back" and "Play That Funky Music") at Tiffany's Bar & Grill, a casual place where locals go (they asked me what I was doing there, lol), and this one table of Asian women behind me loved it so much they kept buying drinks for my friend and I! Caught some sun on Christmas day at Kamaole Beach Park 2 in Kihei with my British bungalow friends Pete and Amy. Never wore a Santa hat on the beach before. Even the lifeguard was decked out! 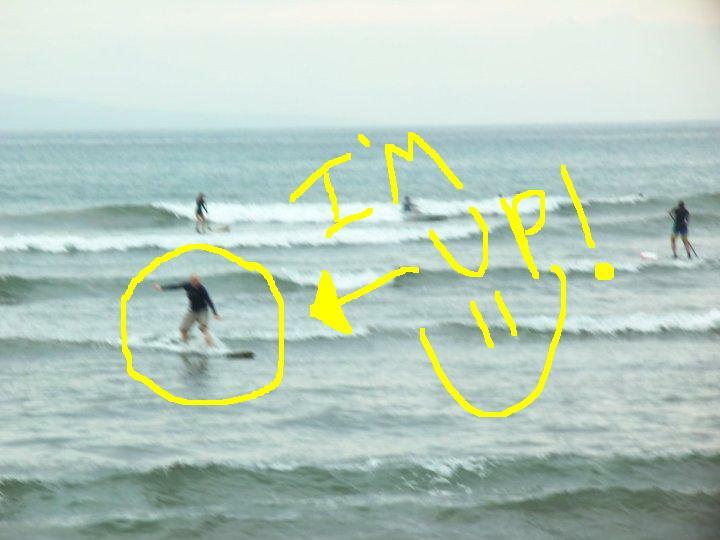 Surfed for the first time! Manager Laina, tour guide Isaac, their dog Koa, and Laina's friend Tina, took Ken and I to "The Cove" (Cove Park), a popular beach for long-boarding and beginner surfing lessons in Kihei. The waves were perfect, only a couple feet high, and after a little observation and a couple tips from Ken and Isaac, I stood right up and rode the wave all the way to shore! 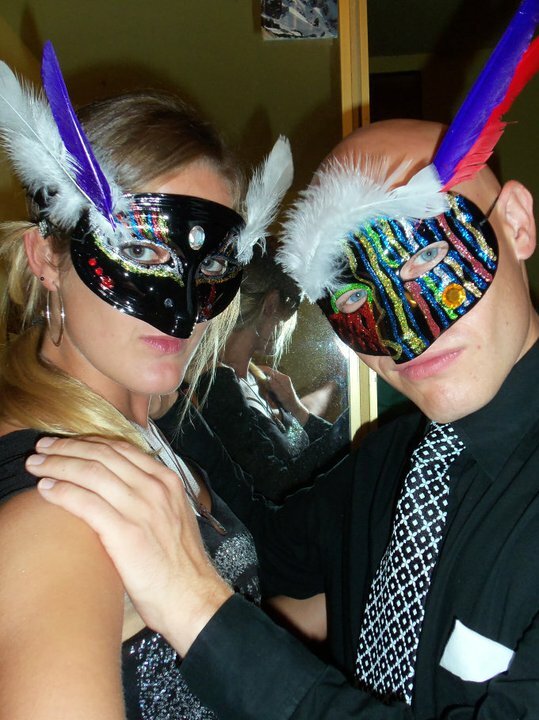 Masqueraded the night away at Banana Bungalow's 2011 New Year's Eve Masquerade Mask Party, featuring a make-your-own-mask decorating table, free keg, and fireworks! Watched professional kite-surfers hone their skills at Kite Beach, "famous for being the World's best kite surfing beach, home to those who originated the sport." Ken got some practice in, while my German friend Hanna watched the action and got to know each other better. Browsed through numerous art galleries along touristy Front Street in Lahaina. Did you know Anthony Hopkins paints? He was being featured in one of the galleries. His stuff isn't too shabby! Joined my Finnish friends Tommi and Hannes for a day of exploring the beautiful beaches and hair-raising roads of Northwest Maui, visiting Ka'anapali Beach (cliff-jumped from Black Rock again! ), Napili Beach (beautiful, fun, family beach), Kapalua Bay Beach (lovely, calm, quiet), D.T. Fleming Beach Park (gets thumbs down, since the beach was pretty much completely shaded by ironwood trees), we stopped the car on the bluffs overlooking Honolua Bay as we thought we saw whale spouts. Kicked back at the beach with bread, brie and beer a handful of times (usually at Ka'anapali), watching the waves, sailboats, sunsets, yachts and catamarans, with the island music of the live bands from Hula Grill in the background. 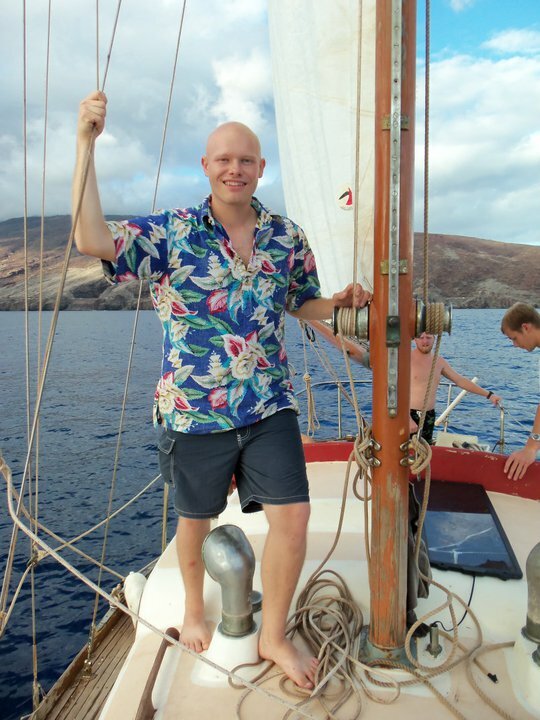 One time I soaked in the oceanfront hot tub of Whaler on Ka'anapali Beach hotel. Another time I went with friends Matt #1, Heidi, and Uschi from Austria, and watched the sunset cliff-diving ceremony. 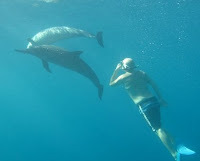 Swam with a school of wild dolphins in La Peruse Bay! A couch-surfing host I previously stayed with recommended it, which in turn I told Jason, who organized some trips out there. There must have been about 15-20 curious dolphins swimming around us. It was one of the most amazing experiences I've ever had. Piled into the bed of a stranger's truck with four first-time hitch-hikers. They had their cameras out like Japanese tourists, LOL! Rocked a toga at Banana Bungalow's "Anything But Clothes Party" on Saturday, January 15th, celebrating tour guide Nadine's birthday with fire-breathing, a free keg, party music, and of course, making a complete fool of yourself by dressing up in your very own custom creation, made of anything but clothes! Did some awesome snorkeling at Palauea Beach (aka"White Rock") with fellow bungalowers Charlie (Montreal), Simon (Denmark), and Devin (Los Angeles). We saw amazing tropical fish and tons of giant green sea turtles (one almost swam me over!). Then we did a little exploring around the rocky outcropping at the north end. So glad I heard about this lesser-known locale from my friend Dirk, because it wasn't in my guidebooks! Smelled the paradise (or poop, rather) at Kahekili Beach Park (aka "Airport Beach"), or as I named it shortly after arriving: "Poopy Beach," lol. It looked nice and had free parking, but we obviously didn't stay long. 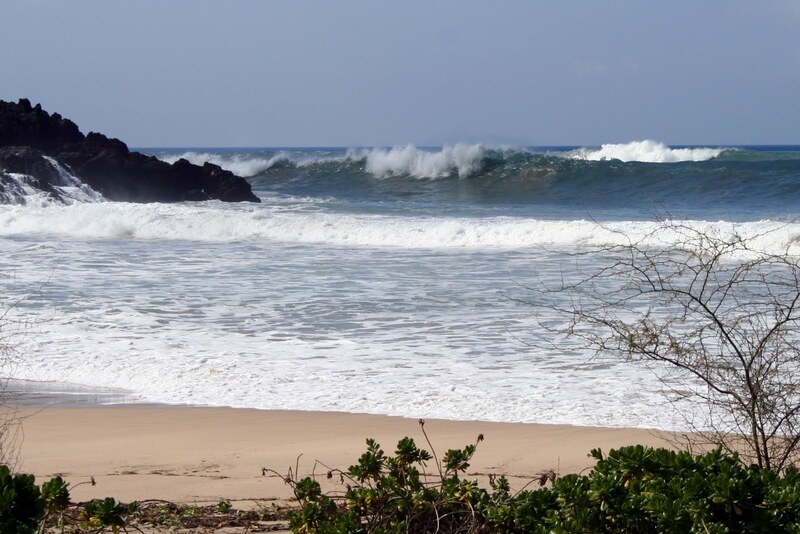 I just googled "Kahekili Beach Smell," because I knew we couldn't have been the only ones who smelled it (though there were plenty of other people on the beach that day), and sure enough, I got plenty of search results indicating there's a sewage treatment plant just up the road. Attended the Old Lahaina Luau with my friend Douglas from Brazil. The food, the cocktails, the dancers...it was an amazing night. ======================================================== Swam with sea turles at a secret snorkeling spot when I was spending the day with a bungalower from South Korea. We were swimming and sunbathing at beautiful Napili Beach, and saw people exploring the reef at the south end of the beach, apparently trying to see sea turtles, so we thought we'd check it out. We didn't see any turtles, but we followed the reef around to a bay, where there was a handful of people snorkeling.